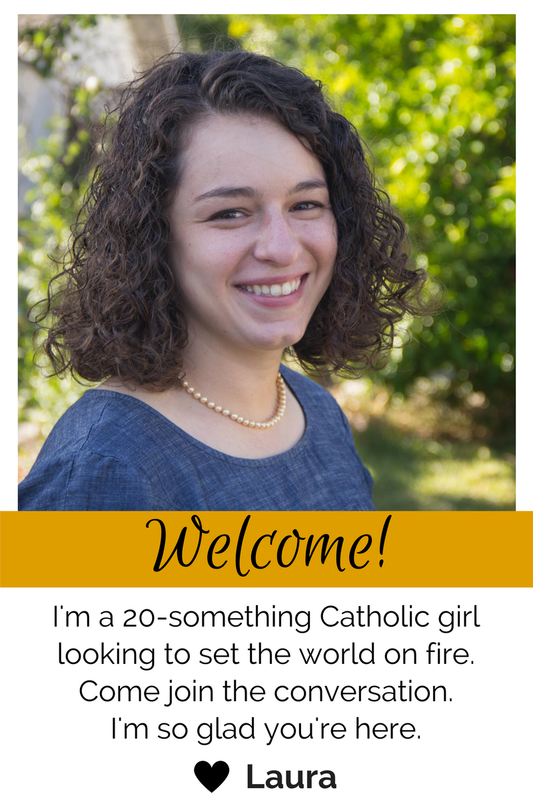 Since beginning pro-life work, I have been amazed at the opportunities sent my way. Seriously. I have no way to describe the ways God has given me to exercise the gifts and talents he’s blessed me with. If no one in my family supported my work, I’d still do it because I believe it’s right. If my friends teased me because of it (okay, sometimes they think it’s a little much 😉 ) I would still continue it because it’s right. If my college tried to silence my voice, I would still do pro-life work because it’s right. And I feel called to it. But the support I have has not threatened my work. It’s nearly blown my mind. Sometimes I feel completely unworthy of the amazing people and opportunities I have been (and continue to be) given. Really, God? Who am I to be doing all this? I’m not anyone special. But then I remember that God doesn’t call the equipped. He equips the called. And I continue this work because I feel called to it. It’s what I’m good at and passionate about. This summer I am honored to have the opportunity to partner with RealOptions in a pro-life internship where I will be working with church and community leaders to build partnerships and to create awareness for the services of RealOptions: professional medical services, practical support for women and men facing unplanned pregnancies, prevention education for students, and post-abortion services. They are a fabulous life-affirming alternative to abortion, and I’m excited to work with them. A wonderful family friend offered to help me set up a fundraising campaign to make this unpaid internship possible and to replace lost income. In just the past couple hours of this campaign being “live”, the support has been incredible. It moves me to see so many people supportive of my work. I’m almost in tears at this point because I can hardly believe the response. I don’t even know what to say except “thank you”. It’s so encouraging to see so many people supporting work that can be so hard sometimes. Though I have to say, there are at least 10 joyful moments for every difficult one in this movement. Like early last Saturday when I had a beautiful conversation freezing outside an abortion clinic with a couple who was there for an abortion. They were hurting so much, and there were anti-abortion (not pro-life) people yelling at them. They told the boyfriend what a sinner he was and so on. The girlfriend came out crying and you could just see the pain. They were talking in the car for a while, and I smiled at them and waved. They drove over and we talked right there in the driveway. They were so hurt by the people that were yelling, and I assured them that I believed in them and saw the greatness in them. They so appreciated that, and I gave them contact information for local free clinics to help them out. She told me was was 3 months along and I got excited and showed them the 12 week fetal model I carry in my pocket there. They were fascinated by it. No one ever told them about their baby. But I didn’t dwell on that. I listened to them express their concerns, and I did my best to let them know we cared about them. They ended up driving away without making a final decision, and I pray they know that people out there care. That moment was so inspiring for me. Their eyes just said everything. They could see that we aren’t all haters out there to condemn. In what little time I had with them, I hope they know they are loved. It’s when we take the time to love people that amazing things happen. I fail at it constantly, of course. We all do. But I cannot even put into words how incredible it is to be part of something so beautiful and human. That’s the heart of it, and the heart of all my pro-life work. It’s all about loving the person. Your support means so much to me. Know that through it, you’re helping me to help make the world a better place. Stay tuned for updates on my work and how you can get involved! Please visit this link to support my work and to share the campaign. Thank you! Contact me or comment below with any questions. We had a big snow dump earlier this week, which called for snow angels! Oh, and TWO snow days in a row. That was glorious. If it weren’t for dangerous roads and falling on icy paths, I would enjoy living in a snowy area. Last night we brought out a trainer for sidewalk counseling, and the event went really well. We have over a dozen people interested. Excited is not the right word to use (because who actually wants to be part of such difficult situations?) but I am looking forward to seeing the impact outside our local clinic. Tomorrow morning is our first trip! I know talking to people will get easier with experience, but I’m a little nervous about dealing with the people who yell. Read more about them here, and pray for us! With starting sidewalk counseling, I’ve been trying to figure out how to sleep on Friday nights. Since coming to college I’ve discovered that I am a pretty light sleeper – which doesn’t work too well on nights when everyone else is staying up late. I can’t tell them to be silent (and not turn lights on later to get ready for bed) BUT I know it’s not safe to drive running on only a few hours of sleep on a regular basis. So I’m kind of stuck. I’ve been thinking about various noise cancelling sort of things, but I don’t really know what’s out there. Any ideas? Mr. Google wasn’t very helpful because it only brought up $300+ headphones. Or earmuffs. Or noise machines. Anyone have experience that could enlighten me as to some sort of solution that is affordable? Anyone see this lovely thing going around on Facebook? To be honest, I am SO TIRED of people saying we hate gay people. Sure, there’s some weird business going on in Russia. I get it. But it’s not like we’re segregating water fountains and telling them to be slaves over here. If being gay isn’t a big deal (hello it’s not – it doesn’t matter to me what your orientations is) then WHY do we make such a big deal out of it? My classes are plugging along. Christian Moral Life is mah fave. It’s quite hard (take the 14 page and 4,600+ word study guide for the first test for example) but it’s so interesting. And relevant. I’ve been working on the study guide for several days with a couple classmates and we’ve gone in to talk with our professor about questions we had. He’s a great teacher and explains things in a highly intellectual (but also understandable!) way. And exciting fact! We each get in groups to debate controversial issues and I got abortion. 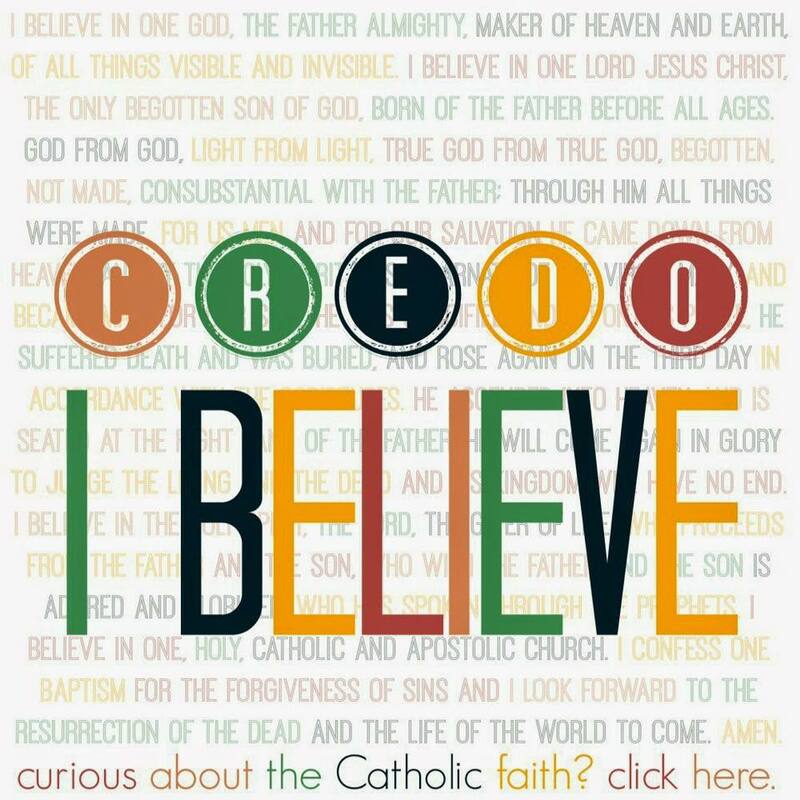 Time to research, learn, and hammer out a defense of the Catholic position. Yes, I’m a happy girl! If I had to chose the hardest part about being an active member of the pro-life movement, it would be the people who aren’t really pro-life. But others think they are. If you’ve been outside an abortion clinic, you’ve probably seen it: the people who stand there and yell crazy thing at people going in. Try to talk to them and they just start going off about how we’re heretics who worship Mary and or we’re not true Christians or something along those lines. Women who are already in crisis mode blast their ipods and huddle close to the boyfriend or mother who is bringing them in as they walk through the barrage of comments. “You’re going to hell!” the people on the sidewalk yell. And the women walk past. Right into the inviting arms of the clinic. When the women are inside, the men stand there using a traffic cone as a megaphone and yell how the clients are violating each commandment. Oh, and the clinic workers? They let ’em have it too. One time in the last few months we were outside praying when a boyfriend/husband/partner of a client inside came out for a smoke. The sidewalk is close enough to this particular clinic that you can talk to anyone and everyone outside. However, the man with his cone took the opportunity to condemn the father and elaborate how much of a sinner he was. And by golly, hell was most definitely in his future. I wanted so badly to go and talk to the father. Just ask him how he was. He was so obviously hurting. You could see it in his eyes. Who knows what circumstances led him and the mother of his child there? I could see that he was almost in tears while being verbally abused by this man with the cone. I wanted to intervene, but didn’t. It was so loud and the people who yell don’t listen to what we have to say. But to this day I feel so bad for the man who was out there smoking and pray he has found some peace. Last time we were outside the clinic, the people who yell were in the middle of a conference (meaning they brought tons of people) and they filmed this video. Be warned, there is some language and graphic signs. You know what strikes me? There are people across the country who do this and they always claim to be bringing the gospel to people. But I don’t see that. Jesus ate dinner with sinners, healed, and forgave them. He met them where they were. These people who call themselves abortion abolitionists condemn people. They yell hateful things. There is no love visible to the world. Oh, AND last time we were there some of them were chatting and taking dance breaks outside the clinic. Now I can’t judge what their motivation is. I know they want to end abortion. But I can’t help but recognize how their movement is centered around a righteous mentality of telling other people what to do. Sure, stand there with a sign. Yell at people. That’s easy, folks. Opening your heart to the clients going in. Putting your comfort on hold to stand in the snow and pray for people who are victims of abortion (the children, women who are coerced, and fathers who weren’t given a say). Getting up at o-dark-thirty on a Saturday morning to offer resources and alternatives to people going inside these clinics. Just being there and starting conversations is hard when you have people yelling nasty things around you. But it’s important because parents need to know they have options. They need to be empowered with knowledge to be able to make an informed decision. They need to know they are people worthy of love, and that they can make a better life for themselves. And you know what? Yelling doesn’t do that. Now you tell me. If you were a young mother or father facing a crisis moment and in total survival mode – which approach would you be more receptive to hearing? Here’s the back ground: Apple (played by Vanessa Hudgens) grew up without her father and with her mother who was a drug addict (and had a partner who was abusive). The mother loved Apple to the extent of the welfare she received from her, though you can’t deny there was probably something deeper. Apple got so fed up from being passed through the foster care system that she ran away to her father whom she had never met. She discovers he is married with the perfect two kids and working on Wall Street. Nice, right? Oh, and conveniently she’s pregnant at 16. Through a various series of events, she decides to keep the baby, but she doesn’t have a place to go. Various acts of kindness from others land her at a women’s shelter for young mothers where she is able to learn to trust people for the first time. Apple grows in a big sisterhood powwow and there are lots of cute babies. The girls all come from diverse pasts, but are bound together with the tenacity they have and motivation they are given from their house mothers to become the person they dream of being. It’s a story of Hope, really, which is the name Apple gives her daughter. That’s the underlying message. No matter what your past is, or what you’re faced with (unplanned babies, crazy mothers who stalk you, etc. ), you can overcome your past. You are more than it. Apple proves that when she has Hope and makes a better life for her. 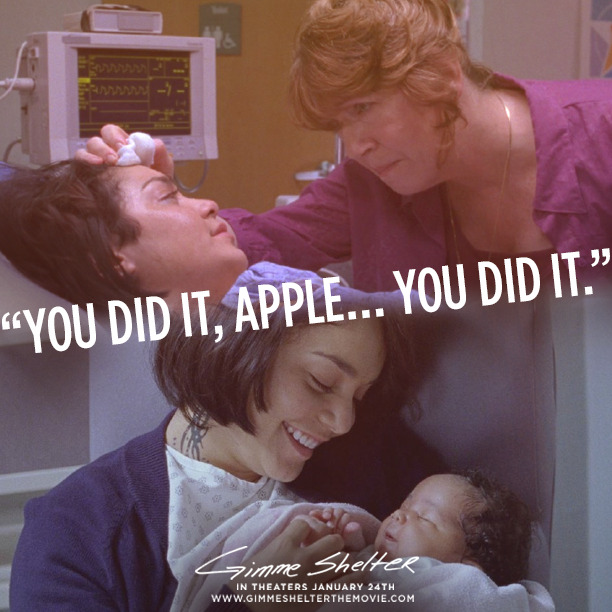 When I first heard of the movie Gimme Shelter, it surprised me what big name actors were in this kind of a movie. With such a life-affirming message, why would they be part of it? Interestingly, it was not made or marketed as a specifically pro-life film, but it certainly gives off that message. It’s certainly no Hollywood-esque type film, but it’s real. It made me cry at more than one part. Another cool thing about the movie? It’s a real story. The woman who started the shelter is Kathy DiFiore (pictured below) who has a big heart for women who just need to be loved in a time when so much is going on. This picture is referenced in the movie. I highly recommend seeing this movie not because it’s the next Hollywood hit, but because it’s a real story of hope. Life bring so much joy, despite the circumstances. It probably won’t be out in theaters for too much longer, so go see it soon! If you have already, what did you think? Connect with me on Facebook, Twitter, Pinterest, and Bloglovin’! Today was Respect Life Sunday, and the national Life Chain event (which was one of the first pro-life events I participated in). We stood at the intersection for an hour with our “Pray to End Abortion” signs and got lots of positive responses from Atchison residents. It was beautiful to see so many people out there willing to stand for life and be a witness in our community. It was especially beautiful to see many of the Benedictine professors out there praying up a storm with their kids. It reminded me of the first time I did this two years ago. It was back home in a much busier and liberal area. 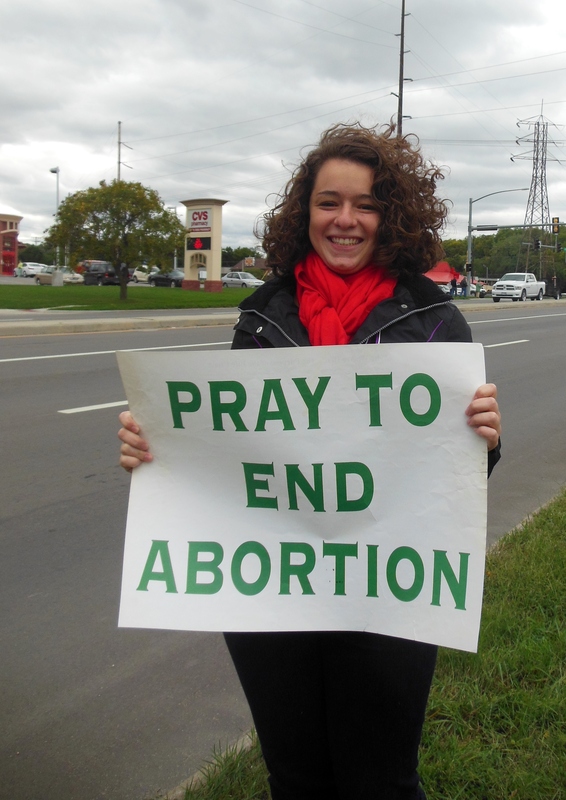 Yesterday I participated in the Life Chain event, a nation-wide peaceful and prayerful event where pro-life people stand along busy streets holding signs. These signs herald pro-life messages such as “Abortion Hurts Women”, “Adoption the loving option”, and “Pray for an end to abortion”. I didn’t know what to expect going to this event, since I’d never been before, but was happy to join others in standing for life. Our local Life Chain happened on a very busy intersection with lots of car dealerships around. I arrived with my Mom and two of my sisters. We hopped out of the car and headed down the road to get signs to hold. We got ours and joined friends along the street. I took my post, watching cars, praying that our quiet witness to life might inspire people who drove past. Most cars zoomed past us. Some slowed down to read the signs. Of those who read the signs and responded, we got at least four positive responses for every negative response. Some waved, or gave us a thumbs up. Others honked and smiled, while a few gave us “the finger”. As I stood there on the side of the road, I wondered what these people were thinking. Did they agree with us? Did they disagree? Do they know what abortion is? Some of them thought we were crazy, as did one man who stopped and told us to quit accusing him of being a natzi *bleep*. Did any of our signs say that? No. Did any of the participants say that to him? I doubt it. I wondered what caused this man to be so bitter against us. Had he been personally hurt by abortion? I hope God blessed him with a good rest of the day, and that he continues to think about abortion. Hopefully he will come to realize the truth of the pro-life movement one day. I smiled and waved back to the people who were honking, waving, and giving up thumbs up. It was great to see those people respond to us. I don’t know if I should be surprised, but so many people didn’t respond to us at all. Some even avoided looking at us. What was going through the minds of the drivers who were just starring in front of them? As each of these people passed by, I prayed for them. I prayed for those who gave us thumbs up that they would have the courage to stand with us, for those who gave us a thumbs down that they will someday realize the truth about the scourge of abortion, and I especially prayed for those who did nothing, those who starred into the distance, and those who zoomed past without acknowledging us that if nothing else we planted a seed in their minds. A little seed that when they encounter abortion in their own lives, they will remember those people standing by the road with signs, and will choose life. If I brought anything away from my Life Chain experience, I came away wishing more people passing by had responded. Even if we had had more negative responses, I would much rather have that than the countless people who did nothing. This is part of what the pro-life movement faced with. We are faced with too many people who do nothing. It may sound a bit harsh, but it’s true. Think about it: Of the hundreds of people who passed by us, I estimate that 10 – 15% responded. Can you imagine if everyone had responded? Can you imagine if everyone was educated about abortion and took a stance on it? Can you imagine if everyone stood up for what they believed in? This is what I see in different aspects of life. People tend to be either uneducated on the matter (and therefore unable to take a stance on it), or do not muster the willpower and courage to stand up and make a difference. How are things supposed to get better, and how are we going to help others see the truth if we don’t do anything about it? I love how this quote summarizes what I’m saying “All that is necessary for the triumph of evil is that good men do nothing.” Boom, bam, baby. I couldn’t say it better. We can’t change hearts and help others to see the truth if we don’t try. After reading this, ask yourself: “Am I a person who is fine watching from the sidelines, or am I a person who stands up for what I believe in, even if I stand alone?” Are you one of those people cruising down the road, or are you standing there with a sign? I sincerely hope that you are willing to stand up for what you believe in. I pray that God gives us all the courage to speak out against evil, because we need more people who are willing to get uncomfortable for what is right. Some people can relate pretty much everything back to their favorite tv show or book series. Me? I can relate most things to the pro-life movement. Why? It’s my passion. It’s what I read about, it’s what I work for, and it’s what I think about quite a bit of the time. Of course I don’t spend my life consumed by it, but it is my cause. How did I get here? I noticed recently that I don’t write many things about my personal life on here. So today (and this week) I decided to start sharing more of that with you. I found my cause a couple years ago, but it happened slowly. Growing up, pro-life issues were not things I knew much of anything about or really talked about. At all. I do remember going to some sort of pro-life rally or protest in Sacramento when I was around 9, but I don’t remember what it was for. I do clearly remember seeing graphic abortion signs, and to this day know which one in particular people were carrying. 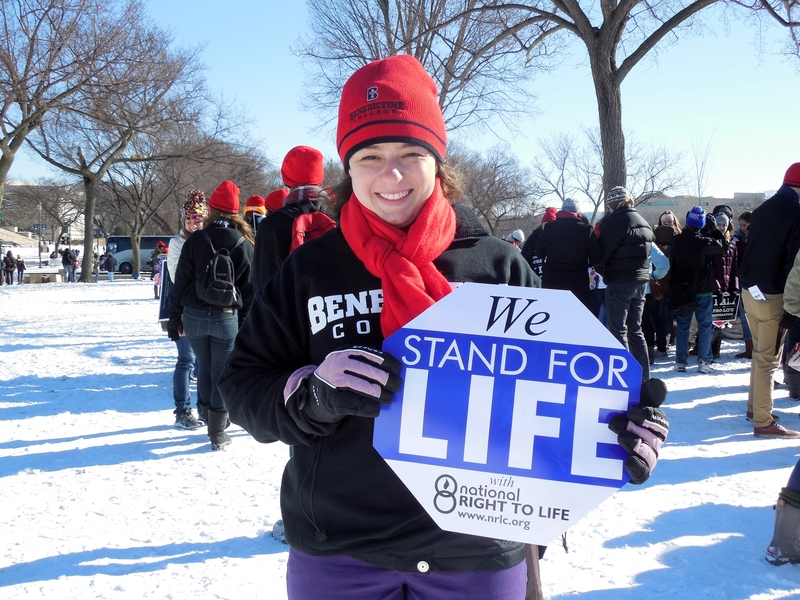 Fast forward to January 2011 when I went to my first Walk for Life. It was an experience unlike anything I had ever been to. It was inspiring and moving. I had never had the experience of being part of a movement like that – something bigger than myself. It’s hard to describe. To know that you are walking for a cause, for the truth, with thousand of other people? That’s pretty powerful. 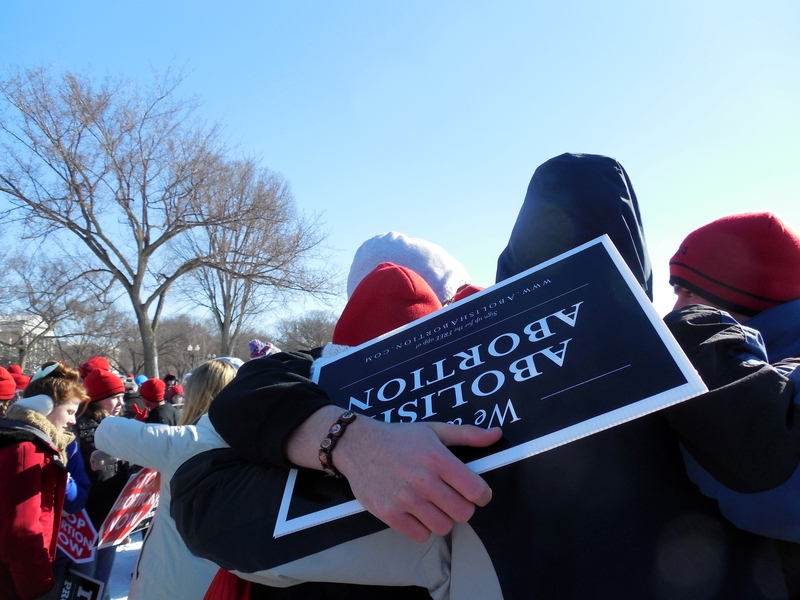 To this day, going to marches and pro-life rallies never ceases to inspire me and sometimes move me to tears. That day I think something was planted in the back of my mind. January 2011 is also when I got my Facebook account and shortly after found Live Action and Life News which I started reading. My eyes were opened to a whole new world I had known absolutely nothing about. In the fall of 2011 someone I know introduced me to someone who introduced me to people at Live Action. The rest, you could say, is history. I started working for Live Action in October, and it all snowballed. I went to the International Pro-Life Youth Conference in November 2011, wrote my first blog post after that, and later started writing for Live Action. Now I’ve worked for a couple different pregnancy centers, and multiple pro-life organizations. This all happened in the span of a couple years, and let me tell you: I could never have imagined being this uber pro-lifer. Just a few years ago, I knew nothing about abortion and related topics. But everything fell into perfect place. And it’s not because I planned for this to happen. In college I’ve met many different kinds of people, but one thing I’ve noticed is that not too many of them are extremely passionate about anything in particular. They come to college to get a degree, and la la la. They don’t really know what they want to do. I’ve noticed this about all sorts of people in other aspects of my life as well. As someone who feels rather strongly about pro-life issues, I am convinced that this is what I was meant to do. We’re all here for a purpose, right? This is mine. Or at least part of it. I cannot imagine now not being like this, but am fully aware that many people are not. Why? I don’t think they’ve found their purpose yet. So this is my message: If you’re one of those people, start exploring things NOW. High school is the perfect time to start finding internships and making connections. If you’re older than that, you’re going to need to hit the ground running. Like now. Learn how to have integrity, and always give your best effort. Get summer jobs. Ask your teachers questions. Don’t know what you love yet? Start with the process of elimination. 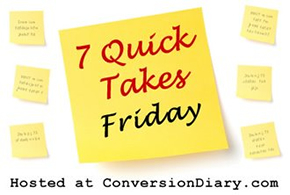 Make a list of tons of jobs and cross out the ones you know you don’t want to pursue. Pray about it. Talk with a friend about your strengths and weaknesses, and how those will play into your future (your parents would be good at that too). Talk to people you know whose work looks interesting. Go to work with them. Read articles. We were all put on Earth for a reason, and if you haven’t found that reason yet, you’re wasting time. Quite frankly, you’re wasting your life. God handed you a specific set of talents and gifts, and it’s your responsibility to figure out how to best use them. If you don’t, you’re basically throwing them in God’s face and saying “Thanks, but no thanks”. You’re missing out on some serious joy too. One of the greatest joys in life is being confident in the fact that you are doing what God wants you to be doing. It’s beautiful. And it just feels right. Do you have what it takes to get there? Did you hear about that #ExposeCPC tweetfest that happened a while ago? It was interesting to say the least. Click on the picture below to check out my latest article for Live Action about it.